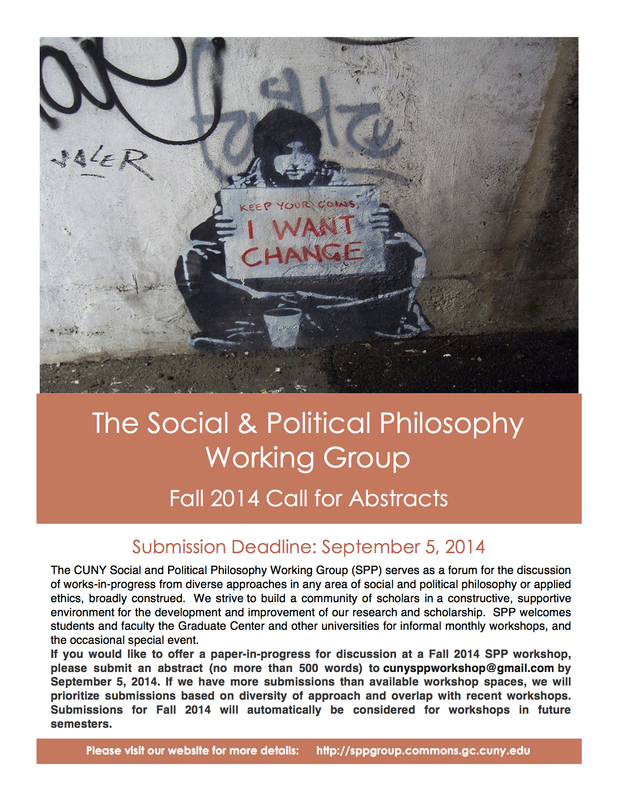 The Social & Political Philosophy Working Group: Fall 2014 Call For Abstracts – Laura Wildemann Kane, Ph.D.
I’m a Co-Chair for the Social & Political Philosophy Working Group. We serve as a forum for the discussion of works-in-progress in any area of social and political philosophy or applied ethics. We have an open Call For Abstracts for our Fall 2014 Workshop series. Please check it out if you have work you would like to present! If you would like to offer a paper-in-progress for discussion at a Fall 2014 SPP workshop, please submit an abstract (no more than 500 words) to cunysppworkshop@gmail.com by September 5, 2014. If we have more submissions than available workshop spaces, we will prioritize submissions based on diversity of approach and overlap with recent workshops. Submissions for Fall 2014 will automatically be considered for workshops in future semesters. Previous PostPrev Article Upcoming Presentation for the Society for Women in Philosophy!